Jenna is a waitress and expert pie maker stuck in a small town and a loveless marriage. Faced with an unexpected pregnancy, Jenna fears she may have to abandon the dream of opening her own pie shop forever... until a baking contest in a nearby county and the town's handsome new doctor offer her a tempting recipe for happiness. Supported by her quirky crew of fellow waitresses and loyal customers, Jenna summons the secret ingredient she's been missing all along - courage. "Much of the score is appealing. But the book tends to flatten most of the characters into comic cartoons...'Waitress' taps into its wellsprings of universal feeling with a slick surface professionalism rather than anything approaching real depth...It is when Mueller tears into the musical�s climactic number that her talents are most movingly harnessed...Suddenly, a pleasant and polished but weightless musical comedy rises to transporting heights, and sweeps up your heart along with it." "A great recipe: Take terrific songs by Bareilles, mix them to a story by Nelson that isn't too sugary, bake that with intimate, understated direction by Paulus and top it off with a powerhouse performance by Mueller...Nelson's script sometimes drifts toward icky sweetness but always seems to quickly cut it with a dash of vinegar...If you're hungry for a heartfelt gooey musical with a molten star in the middle, order up a slice of 'Waitress'." "Echoing a weakness in the original screen source, Paulus and Latarro could be criticized for overplaying the whimsy. But the material is anchored at every step by Bareilles' melodious pop score and Mueller's supremely natural performance as Jenna...The ballads are not Broadway-style songs in that they advance the plot, but they do something just as vital, which is to deepen our affection for the characters and our access to their inner lives." "'Waitress' is clearly, passionately, and for the most part delightfully a feminist musical....'Waitress' can be an uncomfortable genre mix: domestic-violence drama and workplace romcom. That�s in the source material, and the musicalization exaggerates it. What I didn�t expect is that the musicalization could also help to justify the mismatch. As the story rushed toward its conclusion, I began to understand that for these characters, life itself is an uncomfortable genre mix." "'Waitress' owes its sweetness to the mouth-watering goodness of Jessie Mueller...The musical resorts to comic overkill to create characters. But Sara Bareilles has written a charming score that suits the quirky material and Mueller�s dazzling voice and endearing personality...There are good things in the second act, which is more lyrical and less silly...Too bad it took so long to get here." "Simple ingredients can produce scrumptious, and healing, results. That's certainly the case with this delightful adaptation...The libretto retains the warm, gutsy spirit and earthy wit that marked the original screenplay, while Sara Bareilles provides a folk-based score that shimmers and charms, never straining too hard for theatricality�Jenna is also another showcase for the gentle pluck and vulnerability Mueller has brought to various roles." "From score to casting, book to staging, everything comes together with a deceiving ease. 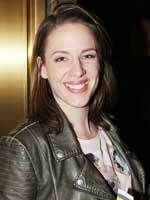 Jessie Mueller is the heart and soul of the show as Jenna. No wonder she takes so easily to Bareilles� score: The songwriter�s piano-driven style combines storytelling and catchy melodies...The show is also better than the movie in how it creates a tightknit, affectionate community onstage." "'Waitress' is a sweet slice of a show that shines with the help of a star ingredient: Tony winner Jessie Mueller...Bareilles has crafted an upbeat, tuneful score that sounds akin to the pop sounds she�s known for with layered harmonies and ballads alongside lively numbers...'Waitress' is warm and endearing, but, like Jenna, it yearns to go somewhere it can�t quite get to. Luckily, the sweetest moments are filling enough." 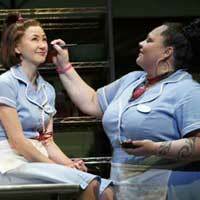 "'Waitress' is really very sweet. Sometimes, like the pies our beleaguered heroine bakes with such otherworldly finesse, such goodness can also get a bit cloying...The distinctions here include a rousing, comfort-food pop score by Sara Bareilles, the singer-songwriter in her confident Broadway composing debut, and the can�t-miss casting of Jessie Mueller...Diane Paulus is in her down-the-middle commercial mood. This new one is an old-fashioned, well-crafted production." "It�s a tall order to combine romantic comedy with troubling depictions of spousal abuse...Nevertheless, the characters are authentic and surprising, and it ends with a heartwarming climax...Bareilles� country-flavored, cute and quirky, introspective songs are nicely integrated into Jessie Nelson�s book...A few questionable choices stick out, like putting the band prominently onstage on a moving platform...Mueller looks browbeaten most of the time, but she has a warm aura and a stunning voice." "A tourist-trap rom-com that has little to offer but Ms. Mueller and her fine supporting cast...Everything that happens in 'Waitress' is as familiar as a cafeteria salad...Jessie Nelson�s book is full of holes...Ms. Bareilles has no notion of how to write for the stage. Her tunes are flat and unmemorably unhummable, and she shoves so many words into each stanza that none of them stand out...Ms. Mueller, on the other hand, is so good that you�ll actively resent the mediocrity of 'Waitress.'" "This show is all about the sugar. Sometimes it�s the light, powdery variety that Bareilles and the rest of the creative team sprinkle over this genial if overly formulaic evening...And at all times, the musical, is bolstered by the zesty energy of Bareilles�s score, a set of sharp pop tunes that provides an antidote to the proceedings� saccharine sitcom sensibility...Mueller has great presence and even better vocal chops, performing Bareilles�s soothing, soaring ballads with style and power." "It is the warmth of the ensemble, the intimate harmonics of Sara Bareilles' music, the fluid fusion of Diane Paulus' staging and, above all, the flaky layers of vulnerability exposed by the show's golden star, Jessie Mueller, that matter most...Mueller's is a performance stripped of condescension, lived in the moment and rich in musical pleasures...Paulus and Latarro know when to use their ensemble and when to keep it in the booths and leave the stage to Mueller." "Fresh and delicious, 'Waitress' has an excellent ratio of sweet to tart; supporting characters who provide crustiness and flakiness; and cooked-to-perfection staging. The whole dish is love at first bite...Jessie Nelson�s broadly comic yet brooding book meshes wonderfully with a frisky, bright score by pop star Sara Bareilles...For all its folksy one-liners and radio-friendly sound, 'Waitress' has a subversive, feminist side." "Paulus�s direction and Nelson�s book never let us forget that Jenna is a victim...The result of all this is that the men�s behavior overwhelms the show...Harsh sound design turns 'Waitress' into the most over-amplified show on Broadway...Paulus has admirably directed a small-scale, low-tech show in every other respect...The imaginative visuals are at total odds with the obtrusive audio...Bareilles has written a couple of sweet duets. She�s good when she keeps it small. " "The positives far outnumber the negatives...The score is a beaut. Bareilles covers the territory with ballads, beautiful choral numbers, big dance numbers and Jenna�s killer anthems. The cast is pleasingly diverse without shouting about it...'Waitress' is a feel-good show that�s no mere guilty pleasure. It�s got soul and heart, sweetness and crust all in fine measure." "Admittedly, the comic coincidences and plot conveniences don't stand the test of realism and the ending is sentimental in a non-rom-com way. But the show's heart is earned through the beauty and integrity of Mueller's work...'Waitress' wears its flaws on its uniform sleeve, but the naked honesty of Mueller's singing is enough to make an overscheduled theater critic wish that the curtain would never come down." �Confirms the Paulus flair for remaining true to her source, but adding the necessary ingredients to make it resonate as a crowd-pleasing musical...A most commendable Broadway debut for singer-songwriter Sara Bareilles...her ability to mix pop, country and R&B serve her well. Her lyrics for the most part display a genuine feel for supporting characters....'Waitress' is handsomely and inventively staged." "Librettist Nelson, songwriter Bareilles, and director Paulus struggle mightily with such elemental theatrical-cooking concepts as ingredients, blending, and seasoning, resulting in a show that is unquestionably flavorless...Bareilles's songs aren't terrible, but they are terrible theatre music...Paulus's direction is fluid but watery, the choreography is at once energetic and listless, and the design looks drab and cheap." "Smartly, the right ingredients for a crowd-pleasing theatrical entertainment have been mixed here: Sara Bareilles� catchy pop-theatrical score, Diane Paulus� steady and relatively unshowy direction, and a first-rate cast led by the finest ingredient of them all: the amazing Jessie Mueller...Every conflict in Jenna�s life feels entirely real in Mueller�s expert hands...I suspect some viewers will be coming back for seconds." "The cast and creative team behind 'Waitress' pulls off a rare feat: They give us a big, happy musical comedy that simultaneously manages to push the form in exciting ways. 'Waitress' is a definite winner...The earnest anxiety of the story is superbly conveyed through a score by singer-songwriter Bareilles...Her gorgeous lyrics move the plot forward while deepening the emotional world of the characters, bringing the best of a pop sensibility to musical theater." "The characters, broadened and amped up several notches to register on the large stage of a Broadway house, eventually do endear themselves even if they are just a bit shy of caricature...Nelson and Bareilles have turned 'Waitress' into a boisterous, lovable, but unsubtle musical! Nothing wrong with that...Diane Paulus, for once, doesn�t gild the lily with outrageous theatrical gimmickry, instead allowing the libretto and songs to shine through the unadorned, powered by moving performances." "Filled with prime ingredients, the evening is a tasty, satisfying, feel-good delight...Bareilles does a satisfactory job in her stage debut. Yes, there are a handful of numbers that entertain while not necessarily helping the musical along. Even so, the score is entertaining, likable, and supportive of the characters...Jessie Nelson takes the story and moves it along swiftly, landing big laughs along the way. Director Diane Paulus does an especially strong job." "Comfort food...That�s thanks to the considerable female power onstage and off...Music and lyrics by Sara Bareilles, a pop songsmith who doesn�t entirely master writing for the stage her first time out, but has her moments; direction by Diane Paulus, much more up-close and intimate...Mueller nails it...No musical for the ages, this 'Waitress,' but an appetizing blend of deep-dish girl-solidarity, an immensely appealing cast, and the scent of pie crust." "Mueller delivers an endearing and accomplished performance�The songs are generally lovely and fitting�As for the drama of the show, there isn�t much�This is not a challenging night at the theatre...The audiences are, pardon the expression, eating it up. As you are encouraged to do, by the way, with a nightly choice of three freshly made tarts. I went with the Key Lime and felt perfectly satisfied. Which is pretty much how you are likely to feel after seeing 'Waitress.'" "Nelson and Bareilles keep the plot faithfully plugging along and even include some fun side antics...The score has Bareilles�s signature melodic riffs...It�s a fresh sound for Broadway...Sprinkled with humor and gravitas, it all feels a bit too familiar, and it is only Mueller�s central character that is given a dynamic arc to play...Mueller is achingly magnetic...The best reason to see the show is not for the meal, but rather who�s serving it. Make sure you�re sitting at Mueller�s table." "There are good reasons to savor 'Waitress,' the sweet and tart new musical confection about love and pie, deliciously performed...Diane Paulus directs with her usual verve, but, in keeping with the material, more down-home and laid-back than usual...Bareilles has written a score full of pleasing songs...The lyrics won�t make Sondheim jealous; the plot is both implausible and yet fairly predictable. But what 'Waitress' leaves us with is the affection evident among the characters." "It features one of the best original pop scores to reach Broadway in years and another knockout performance from Tony winner Jesse Mueller...Bareilles� sensibility proves an ideal fit for the material. Her stirring, melodic songs do everything a well-crafted musical score ought to do...Nelson likewise lends wit and heart to the often-funny script...The production marks a down-to-earth turn for Tony-winning director Diane Paulus...And the company is excellent all around." "'Waitress' is a musical that will leave you verklempt because of Sara Bareilles� sublime music, but seriously unsatisfied with the decision to over-stuff this story�To use the pie analogy, this team took sugar, butter, flour and added chocolate, cinnamon, lemons, ginger, molasses, minced meat and--you get the idea...On the plus side of everything is Jesse Mueller, whose skill at delivering a whole universe in a song is astonishing...I cannot wait to hear these songs again." "It�s easy as pie to fall for 'Waitress'...Deliciousness is on the menu...Mueller�s performance is nicely balanced...Mueller�s also a perfect fit for Bareilles�s alternately sorrowful and empowering songs...'Waitress' does a swell job illustrating the shades of gray in human relationships..Jessie Nelson�s book is sharp. 'Waitress' is more than capably directed by Diane Paulus. The pie is ready. Leave room for second helpings." "The book by Jessie Nelson is serviceable; the score by Sara Bareilles is not very compelling considering the best song in the show is given to a secondary character...The rest are interchangeable ballads. Diane Paulus keeps things moving...Jessie Mueller is quickly rising in the ranks as a top, bona fide Broadway star...If you�re in the mood for a scrumptious piece of pie, why not try the big helpings you�ll get at the Brooks Atkinson? They will surely satisfy anyone with a sweet tooth." "I�m sorry to have to report that Mueller has moved on to the role of Jenna. I�m sorry because everything about her former vehicle was superior to the one she is now carrying...Diane Paulus has slipped this time out. In this adaptation of a decent small film, she has allowed the dumbing down of all the male characters...But Mueller's performance in the very heavy book scenes is excellent, and she fights the inept writing of Jenna by always playing her for real." "As strong as the show already was, these women have somehow found ways of making the show richer, smoother, and even more deeply affecting. The primary achievement of 'Waitress' lies in taking these ordinary people and making them real. It�s a show that makes you shiver with recognition and tear up with empathy almost throughout...For my money, 'Waitress' is a significantly better show than 'Hamilton.'" "A divine Broadway chick flick with something for everyone to enjoy. Broadway darling Jessie Mueller (Jenna) tackles the downtrodden role with gusto and aplomb, bringing life to Ms. Bareilles' music. But what may be more important is that the supporting cast brings life to the show itself�A perfect blend of soulful music, funny dialogue and a quirky cast of characters forms the basis for quite an enjoyable evening." "There are so many things this show does well, but more than anything, there was an element of realness that proved a beautiful contrast to the make-believe and magic that is inherently theatre...There�s a lot of Broadway convention in this show, and some of that is unavoidable, but I was rarely bothered...There�s so much to love in this show. Not only is 'Waitress' worth the wait, it�s also worth standing up for." "The crown jewel of Broadway just arrived�Jessie Mueller took on the role of Jenna with grace, humanity and ingenuity�It left the audience so blissfully connected, you could find them audibly weeping when struggles came afoot. Mueller�s voice filled Sara Bareilles�s iconic style absolutely perfectly, and her connection to the words, be it playful phrases or palpable pathos, was just an absolute treat�Diane Paulus did wonders staging this beautiful show." "Too much of Jessie Nelson�s libretto is silly and inconsequential and simply not as good as Adrienne Shelly�s film. Sara Bareilles�s score, although sounding right for the characters, doesn�t make enough of an impression, either...Jessie Mueller remains far more than above average in talent...Director Diane Paulus has staged much of it so farcically that near the end, when theatergoers should be taking matters seriously, they instead laugh." "...Jessie Mueller's performance as Jenna needs to be seen by anyone who has ever felt stuck in his/her life. Her heart-wrenching delivery of "She Used to Be Mine" will leave even the toughest audience member in tears or at least close to it. If you can't find something in Sara Bareilles' lyrics that reflects something in you, you simply aren't paying attention."